“You are changing the world for the better”. That was London Mayor Sadiq Khan’s tribute to the anti-racism education work of Show Racism the Red Card (SRtRC) as he attended the campaign’s National Schools Competition Awards Ceremony just one week before his election as Mayor of London. 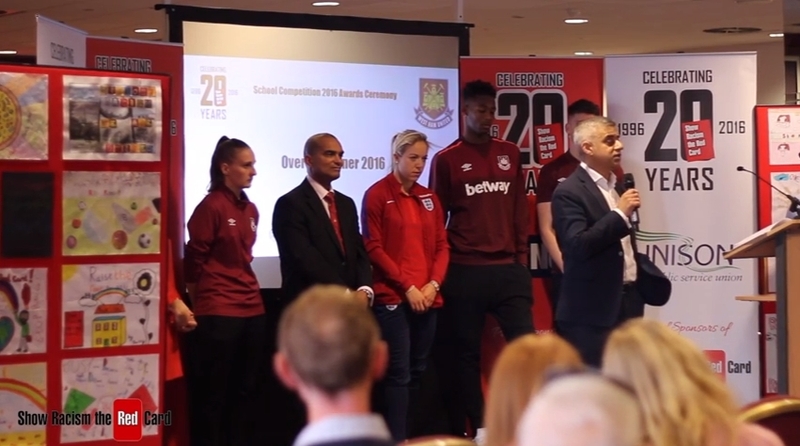 Mr Khan, a long-term supporter of SRtRC, took time out of his busy schedule to visit West Ham United’s Boleyn Ground to help recognise the achievements of young people & teachers from across England and pledge his ongoing support for anti-racism education. The Mayor lauded the anti-racism messages created by the prize winners, reminding them of the strength of competition and stating how inspired he was by the artwork, creative writing and multimedia entries on display. He closed his address by celebrating the work carried out by football clubs and partners such as Show Racism the Red Card to tackle racism and ensure that football grounds are safe and inclusive places to watch football, calling the UK “the envy of the world” in that respect. The awards themselves were presented by TV personality Lisa Rogers and former West Ham United forward and TV pundit Leroy Rosenior, who opened up proceedings recognising the campaign’s twentieth anniversary and paying tribute to the quality and quantity of anti-racism education delivered throughout the two decades. West Ham United’s Sam Byram and Reece Oxford were joined on the stage by two Guests of Honour from the women’s professional game, Chelsea & England forward Gemma Davison and West Ham United captain Katie Bottom. Completing the line up was Assistant Chief Executive of the Professional Footballers’ Association and ex West Ham player, Bobby Barnes. Show Racism the Red Card are extremely grateful for the support of Sadiq Khan and were delighted when he was successfully elected as Mayor of London. SRtRC look forward to seeing Mr Khan’s initiatives in action and look forward to working together with the Mayor in the future.